The heightened and uncertain cost of servicing delinquent mortgage loans is a significant, although underappreciated, constraint on access to credit. Lenders can price loans to reflect the anticipated servicing costs, but it is very difficult to price for the uncertain costs of default servicing. The penalties resulting from not meeting the GSE and FHA timelines, along with restrictive and anachronistic limits on reasonable foreclosure expenses, create uncertainties that are difficult to quantify and price for. The result: lenders forgo lending to borrowers more likely to go delinquent. The FHFA has made great strides with recent changes to compensatory fees, but more needs to be done. Servicing delinquent FHA loans presents an even greater challenge. To expand the tight credit box, these servicing issues must be addressed. Mortgage credit is too tight, as many experts have been pointing out for some time. The median credit score has risen from 701 in 2001 to 743 in 2014. And the new Housing Finance Policy Center Credit Availability Index, which tracks the share of loans that are expected to go 90 days delinquent, has fallen from 17.4 percent in the fourth quarter of 2007 to 5.7 percent in the fourth quarter of 2013. This tightening of access to credit stems not from a contraction in the credit boxes of Fannie Mae or Freddie Mac (the GSEs) or the Federal Housing Administration (FHA), but from lenders applying tighter credit standards within these credit boxes. Many factors cause lenders to apply these credit overlays. Three of the most significant are (1) uncertainty over when and why the GSEs or the FHA will put the credit risk of a loan back to its lender for violating their underwriting or servicing rules, (2) heightened litigation and related reputational risk, and (3) the high and variable cost of servicing delinquent loans. The first two factors have been much discussed, by myself and by others. Here I focus on the largely overlooked third factor. Delinquent loans are very costly to service. 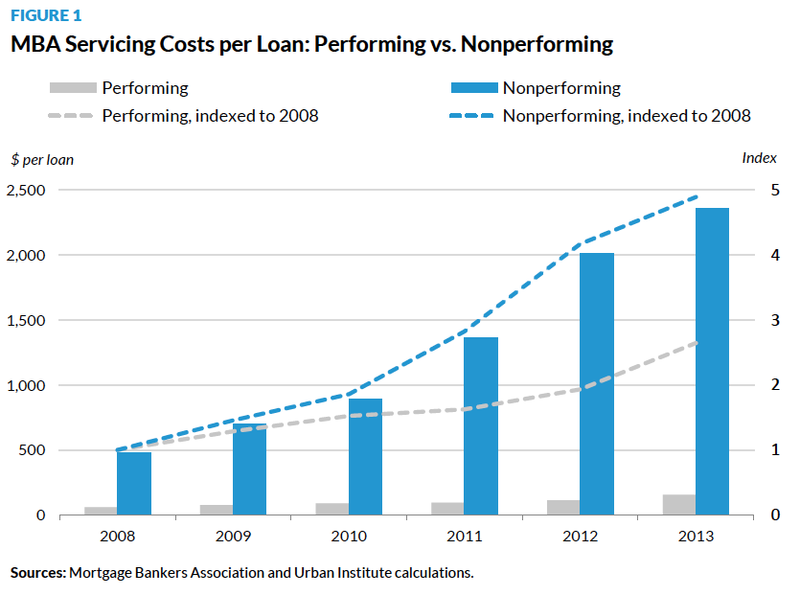 Figure 1 uses numbers from a sample of prime servicers provided by the Mortgage Bankers Association (MBA) to illustrate the total costs of servicing nonperforming versus performing loans. The costs of servicing performing loans include both overhead and direct costs (servicing technology, escrow, call center, web page maintenance, investor reporting, and so on). The costs of servicing nonperforming loans include the base costs of servicing any loan, costs associated with managing a default (collection, loss mitigation, foreclosure, bankruptcy, and so on), and unreimbursed foreclosure and real estate owned (REO) losses. Three points can be taken away from this analysis. The costs of servicing delinquent loans are much higher than the costs of servicing performing loans. In 2013, the annual cost of servicing a nonperforming loan was on average 15 times that of servicing a performing loan—$2,357 versus $156. Though the costs of servicing all loans have risen from 2008 to 2013, the costs of servicing nonperforming loans have risen almost twice as fast as those for performing loans, so the difference between the two is widening. The overall costs of servicing performing loans hasve increased 264 percent, from $59 in 2008 to $156 in 2013. In contrast, the overall costs of servicing nonperforming loans increased 489 percent, from $482 in 2008 to $2,357 in 2013. Nonperforming loans take up more than 50 percent of a typical lender’s servicing resources, despite making up a small share of total loans. The nonperforming percentage of this sample was 6.7 percent: so, if a lender had 1,000 loans, on average 67 of them would be nonperforming. Total servicing costs for these loans would be $157,919 ($2,357 x 67). Total servicing costs for the 933 performing loans would be $145,548 ($101 x 933). Thus, in this instance, the 6.7 percent of nonperforming loans would take up 52 percent of the servicing resources ($157,919/[$157,919 + $145,548]). Servicers price for this difference. Because higher-risk borrowers are more likely to experience delinquency, servicers charge those borrowers a higher rate. Similarly, because the servicing costs for delinquent loans are higher in judicial foreclosure states with long timelines, servicers will charge still higher rates in those states. The mortgage servicing rights (MSRs) market reflects the economics of this difference: MSRs tend to have the lowest value when the borrower is higher risk and the property is in a long-timeline judicial state. Many loans are not made in the first place because borrowers can’t pay the higher rates servicing uncertainties encourage or meet the higher standards resulting from credit overlays. Lenders and servicers cannot adequately price for uncertainty related to the foreclosure process, including long timelines and the possible costs of property preservation and conveyance. Rather than increase pricing, lenders and servicers apply overlays to protect against risk. While a lender or servicer may, on average, make a profit on a group of loans, if the range of outcomes is too wide (i.e., if the probability of incurring a loss is too high), he or she may opt not to make loans with those characteristics at all. Two other issues make it more difficult for lenders to evaluate the costs of servicing nonperforming loans. Increased uncertainty over whether lenders are able to transfer servicing has also increased credit overlays. Historically, lenders had some flexibility on holding or transferring their servicing. This flexibility made them more open to taking on the servicing initially, as they were confident they could unload the work if their strategy or risk tolerance changed. Several regulators have questioned the ability of some specialty servicers to handle the increased servicing volume that they have taken on. That uncertainty has cast a pall over the sector and has given lenders pause over how easily they can transfer servicing should they need to. Servicers are also unsure how much more they will need to adjust operationally to service delinquent loans. Faced with a wave of unanticipated delinquencies coming out of the housing crisis, servicers built systems quickly and inflexibly, often held together with rubber bands, bandages, spit, glue, and a bit of duct tape. Their personnel were often ill-equipped to handle the new demands, making mistakes in dealing with distressed borrowers. These mistakes in turn generated an ever-evolving set of servicing standards, requiring servicers to adapt their systems and enhance personnel training. Though these consumer protections are largely a welcome addition to the servicing landscape, the open-endedness of their development has increased the uncertainty around future servicing costs. Average foreclosure timelines, or the length of time between the first missed payment on a loan to its liquidation, have continued to increase, particularly in judicial foreclosure states, where a court order is required to evict a borrower. This increase reflects a number of factors: borrowers are being given more opportunities to stay in their home through mortgage modifications, state attorneys general have imposed various foreclosure moratoriums to increase consumer protections, and courts are backlogged. Figure 2 shows the number of months a loan is delinquent at the time of REO liquidation. At the end of 2008, the average mortgage was 18 months (548 days) delinquent at liquidation; the average mortgage is now 35 months (1,065 days) delinquent by the time of liquidation. This dramatic extension stems from more loans being left in the pipeline in judicial states (non-judicial states have cleared their pipelines), and the timelines in those states are extending rapidly. Between 2008 and 2014, the share of REO liquidations in judicial states increased from 25 percent to 50 percent; the time of delinquency at time of liquidation in those states roughly doubled, from 21 to 41 months. These timelines are for loans that have actually liquidated; many of the hardest-to-liquidate loans are still in the foreclosure pipeline. Beyond the judicial/non-judicial distinction, each state has its own foreclosure rules, and every servicer must comply with the rules of each state. Though uniform, national foreclosure laws could reduce servicer costs significantly, such a solution is politically infeasible in the current environment. In addition, these protracted timelines often force servicers to run afoul of requirements to expeditiously resolve FHA- and GSE-backed loans. Lenders are thus placed in a difficult position with their various regulators. States and the Consumer Financial Protection Bureau (CFPB) impose consumer protections to ensure that borrowers have a fair shot at staying in their homes. Yet, the Federal Housing Finance Agency (FHFA) and FHA impose fees on loans that take too long to complete the foreclosure process. Often the two mandates are in tension, if not outright conflict. Though an appeals process is available for loans that fail to comply with GSE or FHA timelines, appeals are time consuming because they are loan by loan, and the ultimate outcome is uncertain. The FHFA recently announced three changes that will substantially reduce the costs and burdens of servicing delinquent loans and is considering another important change as well. The GSEs require servicers to pay compensatory fees if the servicer’s timeline to foreclose exceeds the “allowable delays” timelines published by the GSEs. Before November 2014, state-by-state timelines were so tight that two in three loans that went through foreclosure would be flagged as over the allowable limit. While the servicer is not responsible for “uncontrollable delays,” once a loan is flagged, the servicer must establish the extent of such delays loan by loan, a cumbersome process with an uncertain outcome. Compensatory fees compensate the GSEs for the forgone interest on the loan for each day over the timeline that was not deemed “uncontrollable.” The fee is calculated as follows: the pass-through rate on the note, divided by 365, multiplied by the number of days delayed, multiplied by the unpaid principal balance on the loan. Thus, if a $200,000 loan with a 4 percent note rate was 182 days over the limit, the servicer would pay approximately $4,000. However, because the note rate is well above the GSEs’ funding costs, the fee is essentially a penalty to the lenders, not just compensation for the GSEs. On November 17, the FHFA and GSEs announced a number of changes. First, for loans liquidated on or after November 1, 2014, the timelines in 47 states were recalibrated so only 40 percent of loans in the process of foreclosure would exceed the target. While still a large number, this threshold is far below the previous 67 percent. Lengthening the timeline means that fewer loans will be flagged as taking too long, and the fees for loans that exceed the timelines will be lower, as they will exceed it by less. Table 1 shows a comparison of the old and new timelines by state. 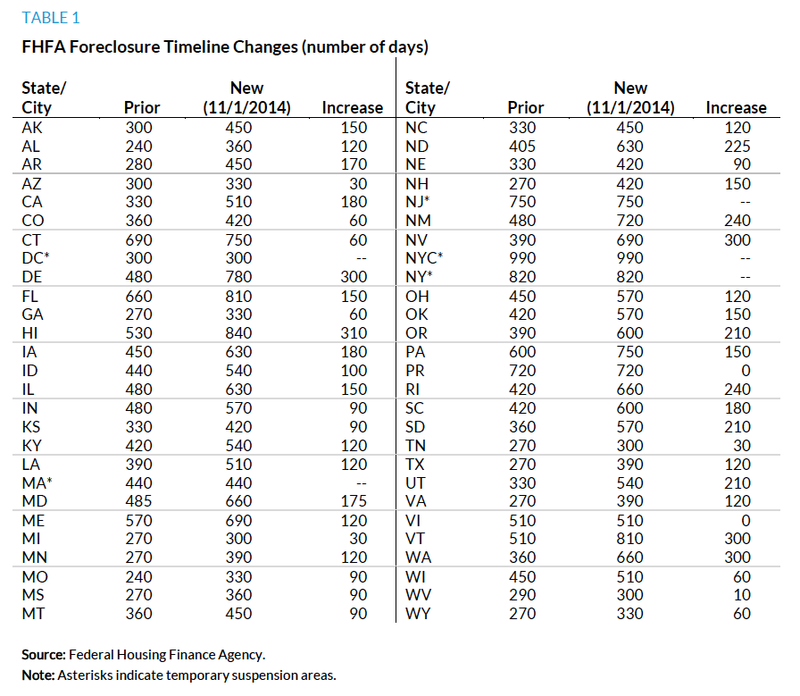 In Massachusetts, New Jersey, New York, and Washington, DC—places with too few liquidations to set a timeline for loans in the pipeline—the GSEs have suspended fees for six months; after this period, the GSEs will update the allowable timelines and retroactively apply them to foreclosures occurring on or after January 1, 2015.1 Thus, servicers will be billed in arrears for compensatory fees on these loans. The suspension of fees in these states and the District of Columbia acknowledges that the original timeline was flawed, at least partly because it measured liquidated loans only, ignoring the most difficult loans that had not yet liquidated. Most market participants assume that FHFA will use the additional time to figure out how to calibrate for the selection bias. The FHFA and the GSEs have also substantially increased the threshold before which compensatory fees will be imposed. Most significantly, after January 1, 2015, a servicer will not be billed if total compensatory fees are under $25,000 in a given month, down from the prior minimum of $1,000. As a result, close to half of servicers will not have to pay compensatory fees at all. For those that do, the amounts will be smaller and less variable. The FHFA is contemplating one additional step. Currently, a servicing error can trigger a repurchase request under certain circumstances—for example, if a lender made an improper modification and the loan defaulted. The FHFA and the GSEs are trying to create remedies other than repurchase for these types of servicing errors. These remedies will also help limit the uncertainty associated with servicing loans that have a higher probability of going delinquent. According to MBA estimates, non-reimbursable costs and direct expenses associated with the FHA’s foreclosure and conveyance policies were two to five times higher than for GSE loans, even before the GSEs changed their compensatory fee schedule. As with all forms of lending, lenders make FHA loans because they are profitable. Loans that go delinquent reduce and at times wipe out that profit margin, so lenders impose overlays to minimize the number of such loans they will have to manage. Several factors are driving this much higher cost, each of which could be addressed. Since 1998, FHA servicers have been required to initiate foreclosure actions within 180 days of default. Missing this “first legal action date” results in the curtailment of debenture interest until the property is conveyed to the Department of Housing and Urban Development (HUD). This penalty is applied whether a servicer misses the first legal action date by a day or a year. For example, assume a loan misses the first legal action date by one day. If the remaining balance of the loan at the time of default is $150,000, the debenture rate is 2.5 percent, and it takes two years to convey the property to HUD, then the lender would owe approximately $7,500 ($150,000 x .025 x 2)—a staggering 5 percent of the loan’s value. Once this “first legal action date” is missed, there is no way to stop the clock. And because the interest curtailment continues until the property is finally conveyed, it is far more expensive to miss the deadline in a long-timeline judicial state than in a short-timeline non-judicial state. The punishment after the clock starts is compounded by new CFPB servicing rules, which extend the timelines and increase the risk of missing the first legal action date. Another example: A borrower submits a completed loss mitigation application after 150 days. After a 30-day review, the servicer determines the borrower does not qualify; the borrower does not appeal by the end of his 14-day appeal period. Thus, 44 days after the loss mitigation application is submitted, the loan is referred to foreclosure, another 30-day process. The foreclosure timeline here is entirely in keeping with the timelines for each applicable CFPB rule but takes 224 days (150 + 44 + 30), again exceeding the first legal action date. Theoretically the servicer could have started the foreclosure process after 120 days, thereby making the HUD first legal action date, but this response may not be appropriate when a lender is in discussion with the borrower, an action we presumably want to encourage. If the first legal action date is breached with good cause, there is an appeal process through the Extensions and Variances Automated Requests System. However, this process is cumbersome and inconsistent. In addition to the first legal action date, servicers are required to manage the process from the first legal action date to the foreclosure sale date according to diligence timelines for each stage, which the FHA has established state by state. The GSE and Veterans Administration foreclosure processes timelines are not broken down by stage, allowing lenders to make up time lost during over-long stages without being penalized, as long as the overall timeline is maintained. FHA allows no such flexibility, so lenders incur penalties even if the overall timeline is complied with. As the Mortgage Bankers Association has pointed out, the overwhelming majority of loans violate at least one of the two preset timeframes.3 While there is an appeal process, the appeals are loan by loan, rendering the process slow and the outcome uncertain. The bottom line is this: a process that assesses fees on the overwhelming majority of loans that default simply makes lenders less willing to underwrite loans that have any chance at defaulting. Moving to a single reasonable FHA foreclosure timeline that is consistent with CFPB regulations would be a major step toward reducing the costs of servicing delinquent FHA loans. The GSEs and the Veterans Administration require servicers to convey title to properties within 24 hours of foreclosure sale or redemption. In contrast, the FHA requires servicers to convey the property within 30 days of a foreclosure sale or the receipt of marketable title, and to complete repairs before conveyance to ensure the property is in “conveyable condition.” This difference arises because the FHA guarantees the loan, which is technically owned by the lender. Only the owner of the mortgage (the lender) can foreclose. By contrast, the GSEs own the loans, and they can direct the lender to foreclose. Thus, the lender absorbs some uncertainties of the foreclosure process, with strict limits on reimbursements. The FHA also holds the servicer responsible for maintaining the property until the claim is paid by HUD, rather than when title is conveyed. This set of requirements presents several issues. “Conveyable condition” is unclear. FHA guidelines require that hazardous materials be addressed, and the property be “broom swept.” However, the standards are often interpreted to mean “marketable condition,” which usually requires a good deal more work on foreclosed properties. This confusion can lead to reconveyances, which are especially costly to lenders. Forced evictions are slow and potentially costly to the servicer; as FHA requires the property to be conveyed vacant. At the completion of a foreclosure sale, borrowers are generally required to vacate the property, but many do not; if the premises are not vacated the servicer would arrange for a forced eviction. In addition to concerns about missing timelines, forced evictions often result in increased damage to the property, exceeding the FHA allowances discussed below. Making this issue even bigger, the FHA covers borrower relocation costs up to $1,000; paying more requires approval from the Office of Management and Budget. In contrast, the GSEs provide up to $3,000 in borrower relocation assistance. And, as of January 1, 2015, to encourage deeds-in-lieu of foreclosure in eight places with long foreclosure timelines (Connecticut, DC, Illinois, Maryland, Massachusetts, New Jersey, New York, and Pennsylvania), the GSEs will pay a supplemental incentive of up to $7,000, bringing total borrower relocation assistance to $10,000 in some cases. Allowance for repairs is often too low and restrictive. The $2,500 FHA allowance for repairs is too small to render many aging homes conveyable. Keeping within the limit is made even more difficult by line-item caps for individual repairs. Even if the home needs only a roof repair and the total is within the total allowance, the roof repair may exceed the line-item allowance. Though servicers can file for a request to go over the limit, the negotiation process is again loan by loan, time-consuming, and uncertain. In certain rare circumstances, it can cost so much to bring some homes, particularly lower-priced properties, into conveyable condition that the servicer will take the loan into its own real estate owned portfolio and will not even bother to submit an FHA claim. Lender responsibility after conveyance increases uncertainty. Between conveyance and final payment, the property can be subject to both continued deterioration and vandalism. This increases the servicer’s costs as well as liability, and the extent of that increase is not under the servicer’s control. All these issues make servicing delinquent FHA loans very costly. This in turn puts pressure on lenders to minimize the risk on the loans they make—that is, to apply credit overlays. The current credit box is very tight. This tightness is the result of heightened and uncertain put-back and litigation risk, both of which have been much discussed. But it is also being driven by the heightened and uncertain cost of servicing delinquent loans. Lenders can price loans for the costs of newly implemented consumer protections, but the penalties resulting from not meeting the GSE and FHA timelines, along with restrictive and anachronistic limits on reasonable expenses of foreclosure, create uncertainties that are difficult to price for. The result: lenders forgo lending to borrowers more likely to go delinquent. The FHFA has made great strides with the recent changes on compensatory fees, but more needs to be done. Servicing delinquent FHA loans presents an even greater challenge, reflecting both rigid and unrealistic timelines and cost limits as well as inflexible but uncertain conveyance and property preservation requirements. The bottom line: in order to broaden access to credit, servicing issues are important and must be addressed. It’s time to give them as much attention as we’ve given reps and warrants. 1. New York and New Jersey are judicial states with an extremely long foreclosure process. Massachusetts and Washington, DC, are non-judicial, with borrower-friendly foreclosure protections that have slowed foreclosures to a trickle. 2. This example, while not identical, drew heavily from examples provided by the MBA. Before joining Urban in 2013, Goodman spent 30 years as an analyst and research department manager at a number of Wall Street firms. From 2008 to 2013, she was a senior managing director at Amherst Securities Group, LP, a boutique broker/dealer specializing in securitized products, where her strategy effort became known for its analysis of housing policy issues. From 1993 to 2008, Goodman was head of Global Fixed Income Research and Manager of US Securitized Products Research at UBS and predecessor firms, which was ranked first by Institutional Investor for 11 straight years. She has also held positions as a senior fixed income analyst, a mortgage portfolio manager, and a senior economist at the Federal Reserve Bank of New York. Goodman was inducted into the Fixed Income Analysts Hall of Fame in 2009. She serves on the board of directors of MFA Financial and is a member of the Bipartisan Policy Center’s Housing Commission, the Federal Reserve Bank of New York’s Financial Advisory Roundtable, and the New York State Mortgage Relief Incentive Fund Advisory Committee. She has published more than 200 articles in professional and academic journals, and has coauthored and coedited five books. Goodman has a BA in mathematics from the University of Pennsylvania and a MA and PhD in economics from Stanford University. The nonprofit Urban Institute is dedicated to elevating the debate on social and economic policy. For nearly five decades, Urban scholars have conducted research and offered evidence-based solutions that improve lives and strengthen communities across a rapidly urbanizing world. Their objective research helps expand opportunities for all, reduce hardship among the most vulnerable, and strengthen the effectiveness of the public sector. Funders do not determine research findings or influence scholars’ conclusions. Urban scholars and experts are independent and empowered to share their evidence-based views and recommendations shaped by research. Copyright © December 2014. Urban Institute. Permission is granted for reproduction of this file, with attribution to the Urban Institute. The views expressed are those of the author and should not be attributed to the Urban Institute, its trustees, or its funders.